The ultra-low profile of the Cinque Collection, is the epitome of clean italian design. Headrests are adjustable to create a break in the profile of the sofa, while the end chair utilizes power reclining to provide additional support. The modified chaise provides ample space for relaxation, whether seated or prone. Chrome finished legs complete the look of this sectional seating group. Available in gray or taupe all leather. 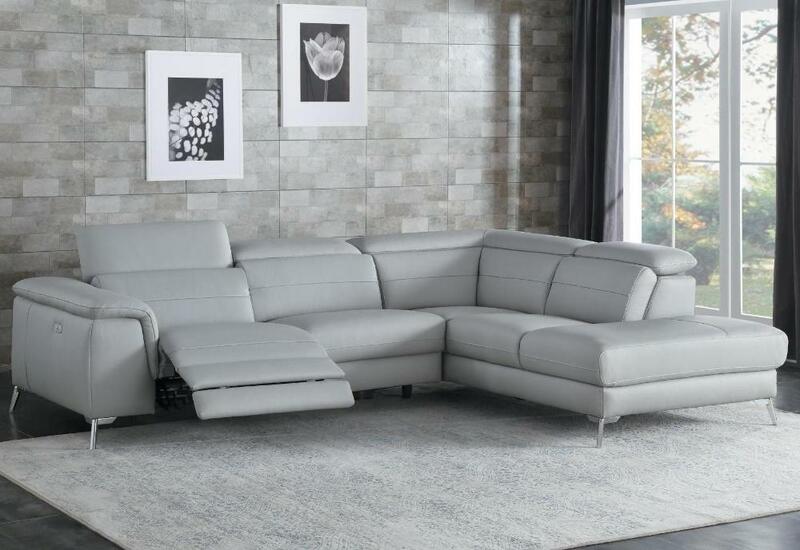 FEATURES: Gray / Taupe Color ~ Contemporary Style ~ 100% Genuine Top Grain Leather Cover ~ Adjustable Headrests ~ USB Port ~ Stitch Accents ~ Plush Backs ~ Chrome Legs.